I’m so glad to FINALLY see more and more K-Cup coupons! 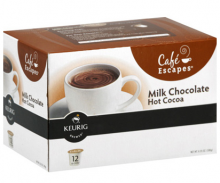 Coupons.com just released this $2/1 Cafe Escapes K-Cup coupon. You can use this coupon on any variety of Cafe Escapes. I haven’t tried this brand yet but I know they make coffee, tea, chai, and hot chocolate. Head over to Coupons.com and see this coupon plus all the new coupons available today. If you can’t find the Cafe Escapes coupon in your location, use zip code 12345.